One of the great things about a superhero television show getting multiple seasons is that, over time, the hero's costume changes and evolves right alongside the hero themselves. On The CW's The Flash, this evolution has seen Barry Allen/The Flash go from a newly-powered police CSI catching his street clothes on fire as he discovers his speed powers to a well-respected hero with a slick costume literally from the future. Of course, the journey from newly-powered to slick costume has seen The Flash through multiple incarnations of the iconic red super suit. 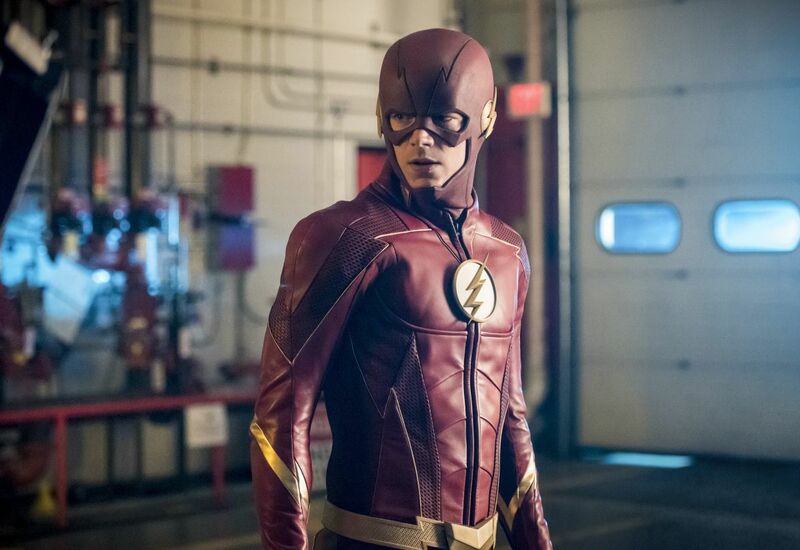 The most recent version, the aforementioned "future" suit, made its debut this past fall with the Arrowverse series' fifth season with a bright red suit that forgoes the "hoodie" style design of its predecessors, continuous bolt-like gold belt, a new mask without the chin strap, and a sleeker version of the hero's lightning bolt symbol. 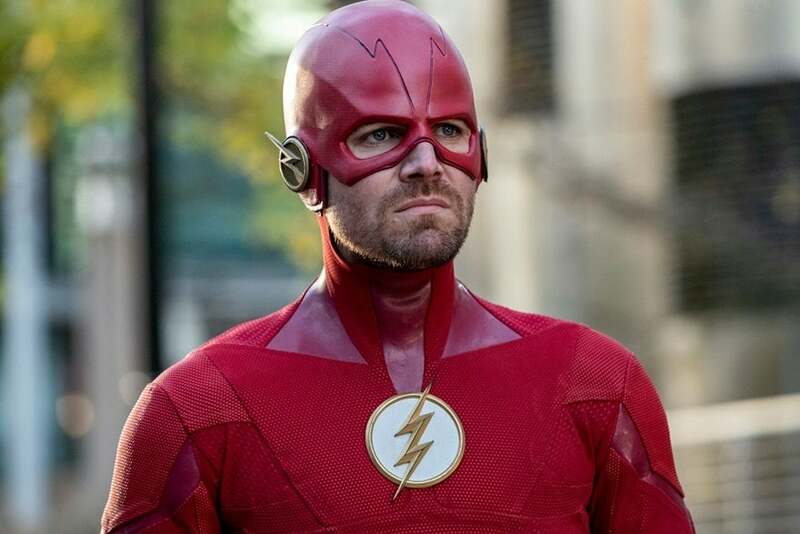 This latest suit has certainly series star Grant Gustin's stamp of approval as he noted in an Instagram post ahead of the suit's debut that "I truly love this suit", but as with all things fans and viewers have their own favorites. 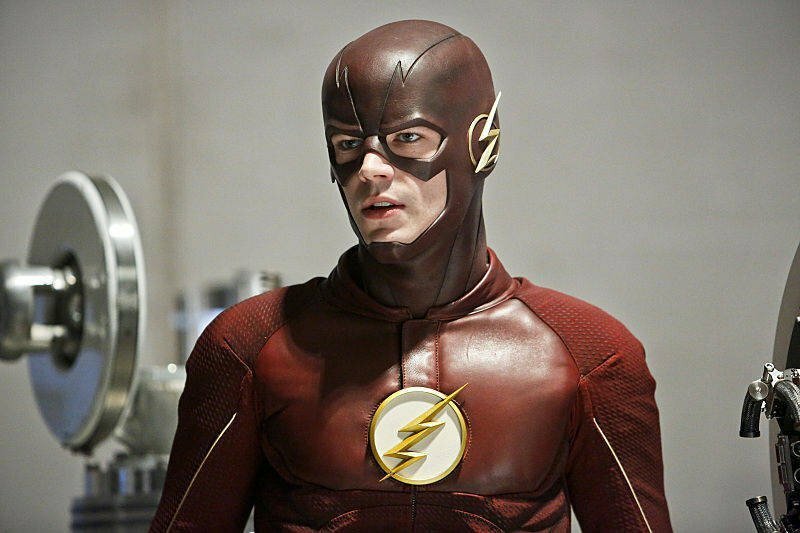 To that end, we here on at ComicBook.com thought we'd take a look at the suits worn by the Scarlet Speedster in the series and rank them from our favorite to our least favorite. We've even opted to rank a suit that some fans might consider a controversial choice. Want to see how we feel about The Flash suits? Read on four our rankings and be sure to let us know what you think in the comments below. 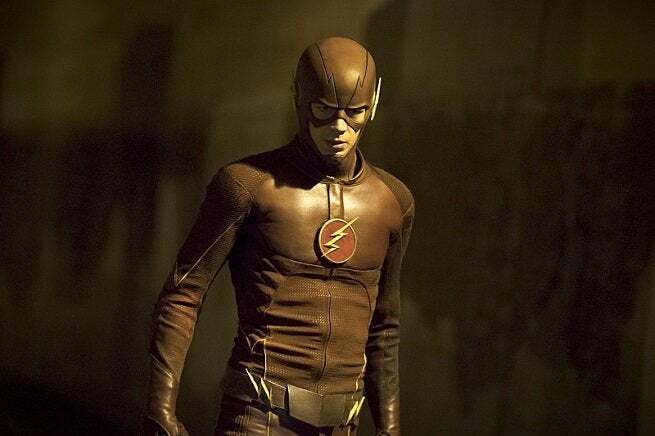 As for the current suit, it will be back in action when The Flash returns on Tuesday, January 15 at 8 p.m. ET on The CW. Probably our least favorite Flash suit isn't so much a suit, but more an outfit Barry wore while Cisco (Carlos Valdes) gave Barry so that they could test his new-found speed. The suit was comprised of a red leotard and reinforced helmet. It didn't really survive Barry's speed testing at the Ferris Air Testing Facility and has never been seen since. It takes the bottom spot on our ranking partly because it's not exactly a true super suit, but because of its limited use. That and honestly? It's not particularly stylish. We told you there was a controversial choice on this list and we're wasting no time getting to it. Technically, the Savitar suit counts as a Flash suit for one simple, but major reason: Savitar is really Barry Allen -- or, rather, a time remnant version of Barry Allen. 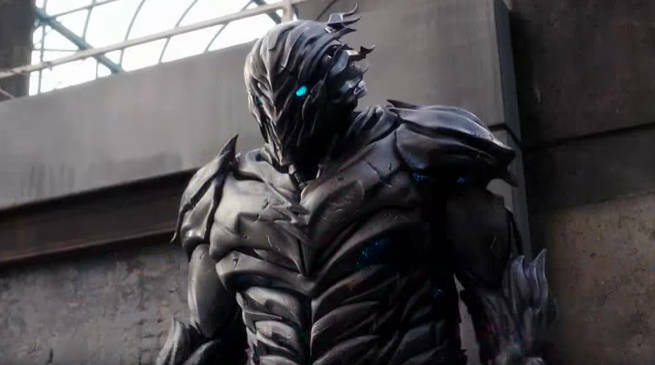 Shunned for being what he was, Time Remnant Barry more or less turned evil, becoming Savitar and tormenting the real Barry Allen in his elaborate suit of armor. Also, if that's not reason enough to classify this as a Flash suit, it's worth keeping in mind that the real Barry briefly wore the Savitar suit, phasing into it in order to destroy it. What? Technically "Barry" is wearing the suit! In Elseworlds, Barry and Arrow's Oliver Queen (Stephen Amell) don't exactly body swap but reality is tweaked so that they are living each other's lives. That means that Oliver became "Barry" and therefore, the Flash. Because of this, fans were treated to Amell suited up in the current (Season 5) version of the Flash super suit and we liked it enough to give it a place on this list. For the record, Amell seemed to enjoy the suit, too. The actor shared a few looks of himself in the bright red costume on Twitter, including a photo of himself with another Flash -- '90s Flash John Wesley Shipp. Coming in at number four is the first real Flash suit. The original suit designed by Cisco featured a red, skintight bodysuit originally designed for firefighters to wear in action. Cisco upgraded it, added a gold lightning bolt logo to the chest, and Barry began to wear it as he took on protecting Central City first as the Red Streak and then as The Flash. Cisco modified it as they went along giving it additional features as they became necessary. As suits go, it's nice enough but it lacked some of the more iconic details future incarnations of the suit would feature. The latest incarnaton of the Flash suit makes the third spot on our list for a variety of reasons. For starters, it's the brightest color of red yet giving it a distinctively comics-accurate look. The solid, gold-toned belt is a great touch, it's not as bulky and leather-heavy as previous suits and perhaps the coolest part about the suit? It's stored within the Flash ring for easy transportation and storage. The suit comes from some point in the future where it is designed by Ryan Choi. It makes its way to 2018 thanks to Nora West-Allen (Jessica Parker Kennedy) who gives it to Barry after his previous suit was destroyed taking out The Thinker's sattelite at the end of Season 4. While this suit is a great departure from previous incarnations, the major element keeping it from being higher on our list comes down to the cowl. The lack of chinstrap has taken a bit of getting used to -- and not all of us are there just yet. 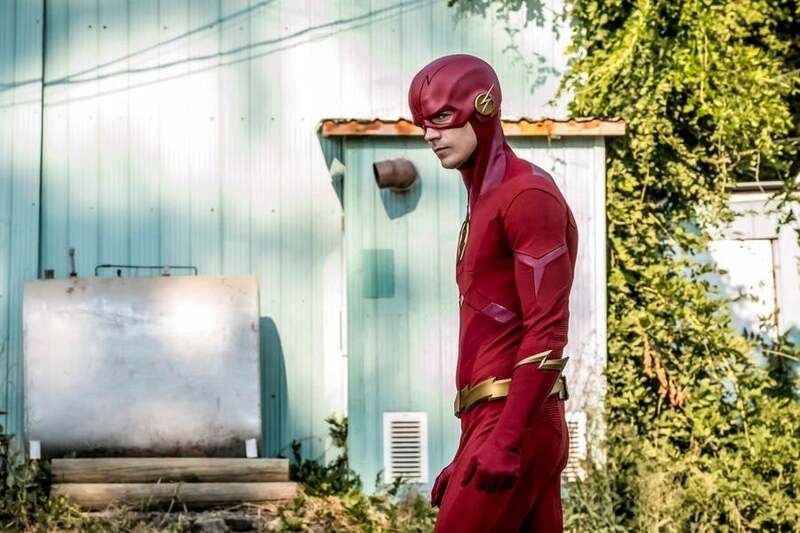 Fans first got a look at the suit taking our number 2 slot when, in Season 3 episode "The ONce and Future Flash", Barry runs to the future to get information that might help him defeat Savitar in the present and save Iris. The suit makes its appearance when, after 2017 Barry attempts to get future Team Flash back together to fight Mirror Master and Top, Future Barry comes out of his depression-fuelled reclusives state, suits up, and joins the fight. This same style suit would make its return in Season 4 when, after returning from the Speed Force, Cisco gives Barry a newly and wildly upgraded suit -- including a feature that allows the suit to self destruct and one that allows it to float. It meets its end when Barry supersonic punches The Thinker's Enlightenment satellite. While it's highly similar to the Season 1 suit -- the biggest change being the coloration of the chest symbol from red to white -- it's the second Flash suit as featured in Seasons 2 and 3 that takes the top spot on our list. The fact that it was featured for such a long stretch of time as compared to the other suits that factors heavily into our ranking. While the first suit was exciting and the current suit is the most comics-accurate, this second suit feels the most like The Flash to us.